In this 10th edition of its flagship annual survey of college general education curricula, What Will They Learn?, ACTA shines a light on the wide disparity in academic standards at insitutions of higher learning across the country. What Will They Learn? reviews the core curricula of over 1,100 four-year public and private institutions across the country to determine the rigor of each school’s general education program. Ratings are based on how many of the following seven core subjects are included in the curriculum: Composition, Literature, Foreign Language (intermediate-level), U.S. Government or History, Economics, Mathematics, and Natural Science. Grades are awarded on an “A” through “F” scale, depending on how many of the seven core subjects institutions require. This year, 366 schools earned an "A" or "B" grade, while over 400 received a "D" or "F." Too many colleges and universities conitinue to offer unstructured and chaotic curricula, causing students to sort through a plethora of course options in the name of "choice" and "self-discovery." What Will They Learn? 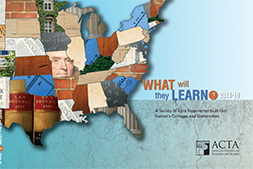 2018-19 and its interactive companion website WhatWillTheyLearn.com, can help orient students, parents, and trustees as they consider what educational quality looks like in 21st century America. Western Kentucky University is pushing back on a D grade its general education requirements received from the American Council of Trustees and Alumni in a survey that reviewed academic standards.